What’s The Itinerary For My Great Ocean Road Day Tour Look Like? Our Great Ocean Road day tour is a full day trip spent exploring this truly majestic stretch of diverse coastline, taking in its amazing array of spectacular attractions. The scenic journey in our air conditioned bus along the Great Ocean Road is a highlight in itself, as we absorb some truly amazing coastal scenery, with new views being revealed around every bend. Experience the roaring surf, white sand beaches, rocky outcrops and towering cliffs. Our Great Ocean Road day trips make stops at numerous beaches, lookouts and other scenic spots allowing you an opportunity to take plenty of happy snaps, as well as to simply relax while enjoying the stunning views. We visit an area on our Great Ocean Road day trip where the local koalas are particularly abundant, ensuring excellent koala viewing while enjoying a stroll amongst the sweetly-scented eucalyptus forest. We’ll also meet some of our favourite feathered friends, as numerous colourful local parrots call the Great Otway National Park home. Our tour’s lunch stop is at the foot of the Otway Ranges in the beautiful town of Apollo Bay, Australia. Your included lunch is provided at a local cafe, with time allowed to explore the shops and the marina or to have a dip in the bay itself. After lunch our Great Ocean Road tour takes us into the mountains, where we take a stroll in the Great Otway National Park. Wonder at the intricate beauty of the ancient rainforest and marvel at the region’s towering native hardwoods, some of the tallest trees anywhere in the world. Then of course it’s onwards to the Port Campbell National Park, where you’ll be awestruck by the world famous rock formations including of course the 12 Apostles, the sensational (but much underestimated) Loch Ard Gorge, and the collapsed London Bridge. 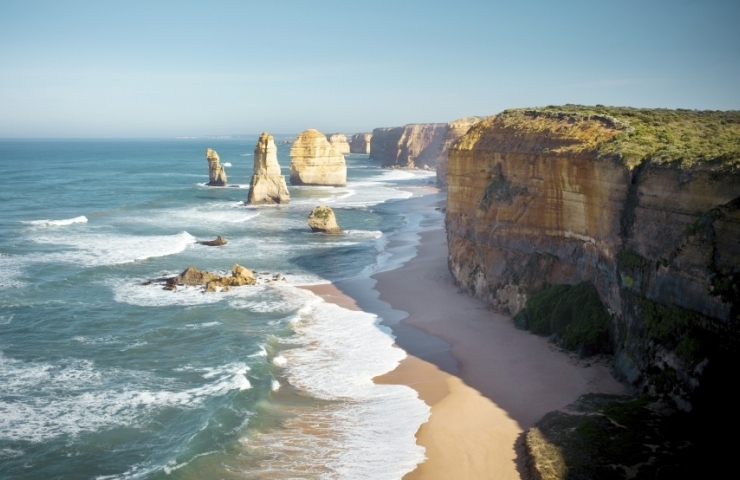 Book your Place On One Of our Great Ocean Road Bus Tours From Melbourne Today! We depart on our Great Ocean Road trip from Melbourne early to beat the crowds and return around 9.30pm for a full Melbourne day trip experience. The trip back to Melbourne is a great chance to upload photos of your Great Ocean Road tour, send E-Postcards, and research your next destination as we proudly offer free Wi-Fi on board all our Melbourne day tours – the first tour operators to do so. We make a stop for dinner before enjoying a stunning view of the illuminated city as we cross the Westgate Bridge again on the way home. Our smaller air-conditioned buses allow us to access areas the larger coaches can’t. They also allow for a more personal tour experience with the benefits of a small group environment. So come along and let our Great Ocean Road tour guides give you a value-packed day of outstanding sights, information and entertainment, with plenty of fun and a few little surprises along the way. Whether you’re looking to experience the 12 Apostles on your tour or get close to nature, there’s something for everyone.